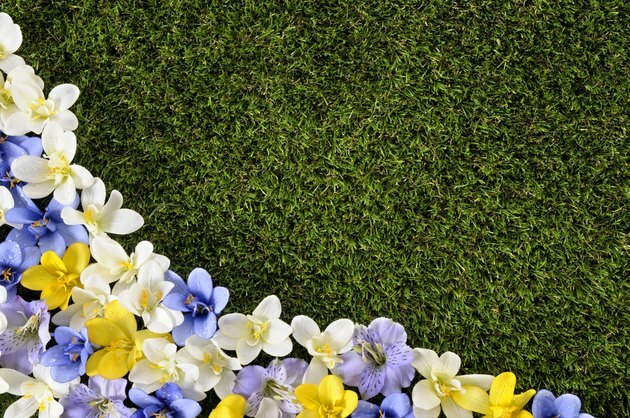 Creating a neat edge between your lawn and flower beds is one of the quickest ways to improve your garden's appearance. You can maintain your lawn edge by regularly cutting it, or you can build a barrier to prevent the grass from invading your flower beds. Grasses either grow in bunches or spread through underground shoots, called rhizomes. Bunching turf grasses are slowest at overgrowing lawn edges, but all grasses spread over time. The type of edging you choose should reflect your overall garden style, such as a neatly cut edge or brick edging for traditional gardens, or timber edging for rustic yards. Flower bed at the edge of a lawn. Cutting an edge between a lawn and flower beds involves removing the grass and creating a shallow trench to slow its progress. Stand on the lawn to cut the edge. Push a broad-bladed spade 4 inches deep into the lawn edge, and lever the spade upward. Continue in the same way around the edge. Remove the cut grass, and rake a gentle slope from the bottom of the trench into the flower bed. If the lawn edge is overgrown, place a garden hose as a guide to show you where the edge should be, and mark its position with landscape paint, removing the hose and cutting the edge. You can also use an edging knife, hoe, weed trimmer or power edger to cut a lawn edge. If you're using a power tool, wear sturdy shoes, long pants, a long-sleeved shirt, leather gloves and safety goggles. A horizontal layer of bricks or pavers creates a neat edge between a lawn and a flower bed. Mower wheels run over the surface of the brick or paver barrier, and the mower cuts the invading grass. Dig a trench as wide as the bricks or pavers, and 2 inches deeper, at the lawn edge. Spread a 2-inch layer of landscape sand over the base of the trench, and lay the bricks or pavers on top. Use a builder's level to make sure they're even and level, and work sand into the gaps. The brick or paver barrier should be level with the lawn surface. Raised edging forms a vertical barrier against lawn grass, and prevents it from invading flower beds. 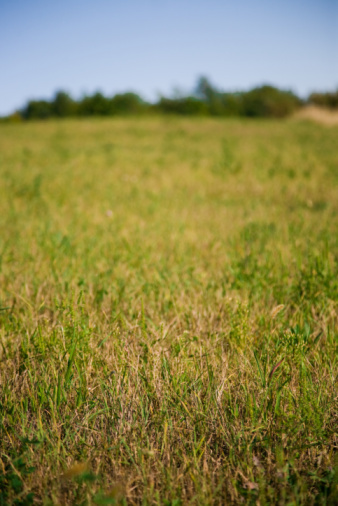 To restrict grass rhizomes, set raised edging at least 6 inches deep in the soil. Lumber, log rolls, cedar shakes and commercial metal and plastic edging strips are some options. Redwood, cypress and cedar are the best types of lumber for lawn edging because they're rot-resistant. To create a raised lawn edge, dig a trench to the depth required to allow at least 4 inches of the edging to protrude from the soil, and set the edging in the trench. Fill in the gaps on either side of the edging with soil. Grass will soon grow to cover any bare soil on the lawn side. Commercial edging strips may come with anchors to help hold the edging in place. After mowing the lawn, you may have to trim the grass growing next to raised edging because the mower can't get close enough to cut it. You can trim grass with hand shears or a powered trimmer. Cool-season grasses tend to overgrow edging more slowly than warm-season grasses. Tall fescue (Festuca arundinacea), which grows in U.S. Department of Agriculture plant hardiness zones 4 through 7, and perennial ryegrass (Lolium perenne), which grows in USDA zones 3 through 6, are bunch-forming, cool-season grasses that don't spread rapidly into flower beds. These need trimming once a year or less. Kentucky bluegrass (Poa pratensis), which grows in USDA zones 2 through 6, is a cool-season grass that spreads slowly through rhizomes. Cutting the edge of a Kentucky bluegrass lawn in spring, late fall and maybe once more per growing season, provides a neat edge year-round. Zoysia grass (Zoysia japonica), which grows in USDA zones 5a through 10, and Bermuda grass (Cynodon dactylon), which grows in USDA zones 7 through 10, spread vigorously and need frequent trimming back throughout the growing season. Both grasses have a tendency to become invasive in some locations.